The LG G Pad 7.0's simple design is comfortable to hold. It has an IR blaster, a microSD card expansion slot and an IPS screen with wide viewing angles. However, without no exception, this Android device has not been spared from the incapability of playing DVD directly. 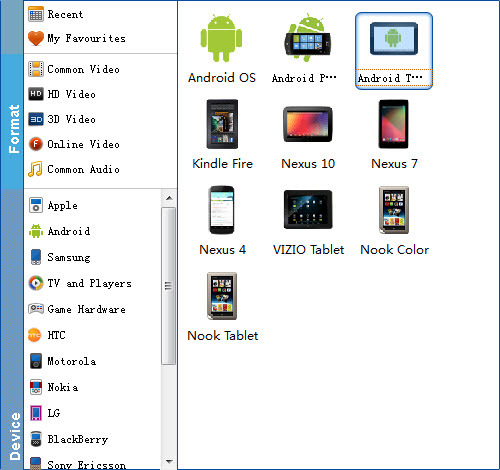 Despite of this, you still can copy DVD movies to LG G Pad 7.0 for enjoyment. What you need is just a suitable DVD Ripper in hand. This article will tell you how to convert DVD to LG G Pad 7.0 (8.0/8.3/10.1 included) playable video formats so that you can enjoy your favorite DVD movies on the go. The recommended DVD to LG G Pad converter is EaseFab DVD Ripper. It can professionally rip DVD to LG G Pad 7.0/8.3/10.1 supported video format with fast speed and excellent output quality. In addition, this DVD ripping tool can also convert DVD to various popular video formats like AVI, MP4, WMV, MPEG, MOV, FLV, MKV, 3GP, etc. as well as rip DVD to optimized video for playback on iPad, iPod, iPhone, Zune, Creative Zen, Archos, iRiver, Blackberry, Xbox 360 and more.If you are a Mac user, you can turn to EaseFab best DVD ripper Mac (Yosemite included), which has the same function as the Windows version. Now download the right version and follow the tips below to finish your task. This quick start guide takes DVD Converter Windows version (Including Windows 8) screenshots as an example. The method to convert DVD movies to LG G Pad on Mac(Yosemite) is the same. All that you should take care is to download the right version according to your situation. After all necessary settings, simply click the big Convert button to start converting the added DVD files to LG G Pad compatible videos. Wait for the conversion to complete and click Open Folder to get the converted videos instantly. After that, transfer them to your LG G Pad 7.0/8.0/8.3/10.1 tablet and watch them anywhere you go. Just enjoy your movies!